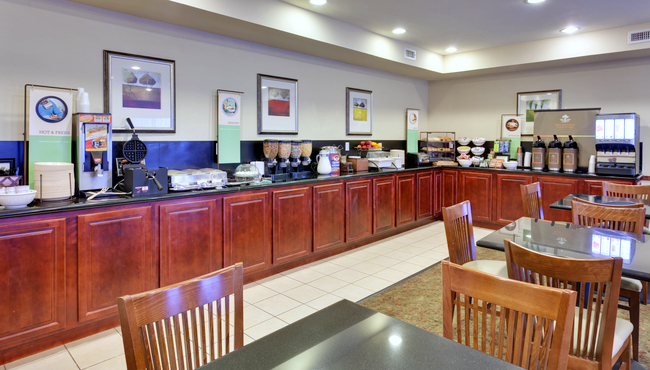 During your stay at the Country Inn & Suites in Absecon, take advantage of our free, hot breakfast, which includes bacon, sausage, egg patties, bagels, hard-boiled eggs, waffles, fresh juices and more. Enjoy your meal with a complimentary copy of USA Today and a steamy cup of coffee. For lunch and dinner, our ideal location is convenient to a number of national chains and local eateries. A family favorite, Applebee's offers traditional America fare and delicious drinks. Enjoy fine Italian food and pizza at this great restaurant just minutes from the Country Inn & Suites. Don't pass up the chance to visit a true American classic, where patrons can pick from delicious burgers, huge salads and other great menu options. Take the short drive to this exquisite bistro in Atlantic City that offers new approach to Asian cuisine. Seafood doesn't get any fresher than at Phillips. This Atlantic City restaurant is a local favorite. With fresh Italian cuisine and delicious breadsticks, everyone will love this national chain. This family-friendly pizza restaurant serves up piping hot pies and a welcoming atmosphere. With a large salad bar and extensive menu, everyone will find something to enjoy at Ruby Tuesday's.